REBGV: combines all price range SDH sales + MOP sales. SC Realtor® Gary Little: combines all price range SDH sales; reports MOP sales separately. Skook: combines SDH sales < $1 million dollars + MOP sales; reports $1 million dollar sales separately. 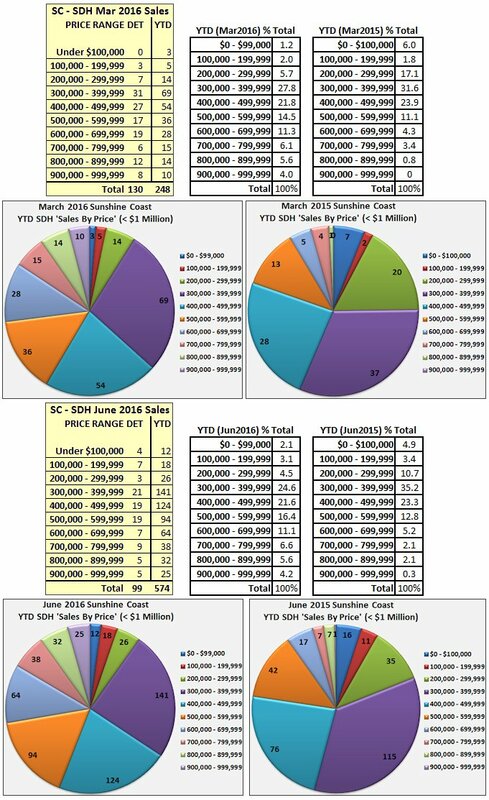 The chart below clearing indicates the data source - REBGV - and thus represents all SDH sales above and below $1 million dollars and includes MOP sales. Impressive line, isn’t it? 2016 sales look like The Chief in Squamish (Stawamus Chief Mountain) with its near vertical rise and fall. The chart clearly shows SDH sales gathering momentum in 2015 and going berserk at the beginning of 2016. In the last few 2016 stats posts, I reminded readers of a Bloomberg/Vancouver Sun real estate article that I posted in full back in October 2016. I believe the piece influenced SC sales and is responsible for the second peak before sales took their steep descent due primarily to lack of inventory. We are now witnessing the second real estate boom over fifteen years. 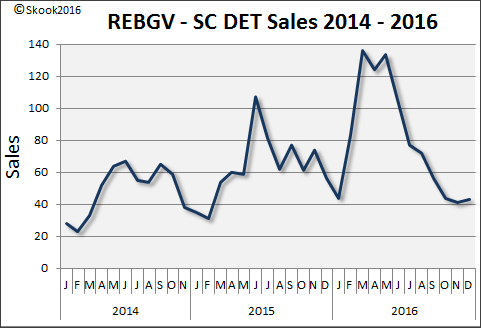 The table below shows SDH sales data back to 1998 - primarily derived from REBGV’s monthly statistics packages. What is interesting to note is that despite the resent frenzy which began mid-2015, monthly sales only bettered the previous boom’s peaks 5 times as the percentage change column demonstrates. Jun 2015 sales tied June 2005. It would be very interesting to speak to Realtors® who’ve experience both booms and hear what they think are the similarities and differences between the two. 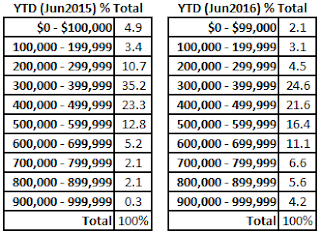 Pender Harbour led market areas YOY with total 2016 sales up 51% over 2015; Sechelt came in second at 30% YOY. As I was tracking monthly 2016 SDH sales by price range, I sensed a significant shift in distribution compared to the previous year. This small table illustrates just how significant this shift was. 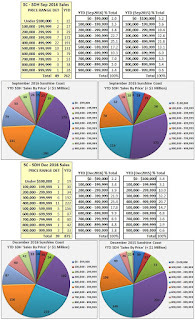 In 2015, sales below $400,000 are almost evenly split with sales priced at $400,000-$999,999 with the upper edge going to sales below $400,000 (50.6%). 2016 sales dramatically flip this on its head. Sales below $400,000 have dropped to 31.4% of total while sales between $400,000-$999-999 soared to 68.6%. In 2016, sales in the higher price ranges increased by almost 20 percentage points vs 2015. If we scroll back to the historical sales table above, we see that peak sales in 2015 occurred in June at 107. The image below shows the June 2015 YTD % Total and its June 2016 YTD counterpart. Comparing the mid-year totals show the $200,000-$299,999 range dropped 6.2 percentage points; $300,000 to $399,999 (majority range in 2015) fell a huge 10.6 percentage points. $400,000-$499,000 held somewhat steady dropping only 1.7 points. 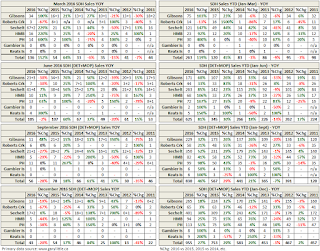 Those losses seen in the lower ranges were dramatically made up throughout the higher ranges. $500,000-$599,999 rose 3.6 points; $600,000 to $699,999 by 5.9 points; the next two price ranges rose by 4.5 and 3.5 with $900,000-$999,999 increasing by 3.9 points. 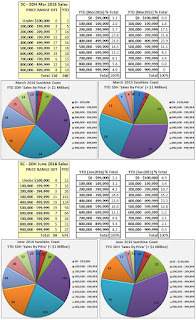 The next two images below looks at 2016 quarterly (March, June, September, and December) YTD sales and offers 2015 comparison. 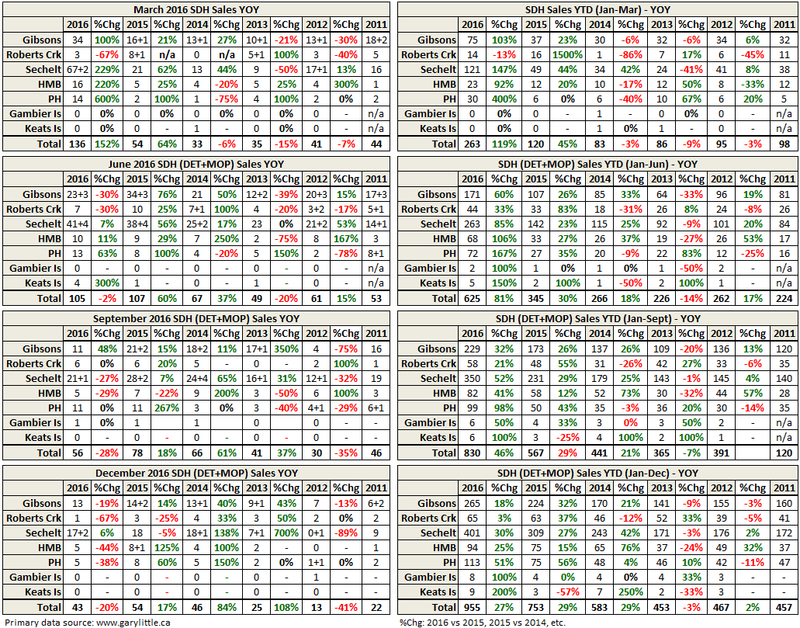 The yellow tables shows 2016 year-to-date totals in the right hand column. 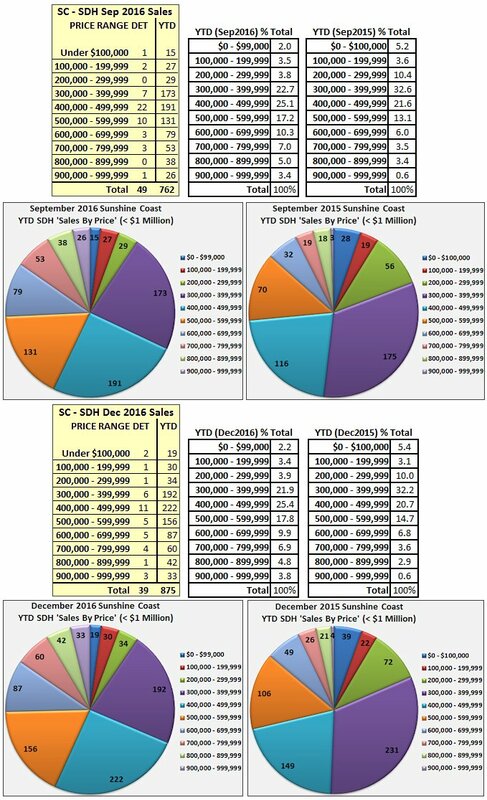 Year-end percentage totals show the bulk of sales in 2016 occurred at the $400,000 - $499,999 range and sales at $600,000 - $999,999 grew significantly. Buyers to the Sunshine Coast either have deeper pockets or are willing or able to go deeper into debt to purchase either the house of their dreams or a residential investment they will flip in one or two years. Saretsky links to a very interesting post on his blog that is well worth the read. Read the comments, too, as Saretsky has something to say about bad loan practices in the Van market (sub-prime, little income verification). Extrapolating to the Sunshine Coast, how many Vancouver speculators used a HELOC to finance a down payment on an investment property on the SC whether land, attached or detached? I am sure more than a few owners on the SC jumped on board, too. It happened in the last boom and I’m sure it has happened in this one. CBC reports today, July 10, 2017, that at the end of 2016 Canadians owed $211 billion on home equity lines of credit.